Home > Gyan > IIM > IIM_CAT > Resource > Thoughts > Bracing to Bell the CAT? Here's some help for you !! Bracing to Bell the CAT? Here's some help for you !! 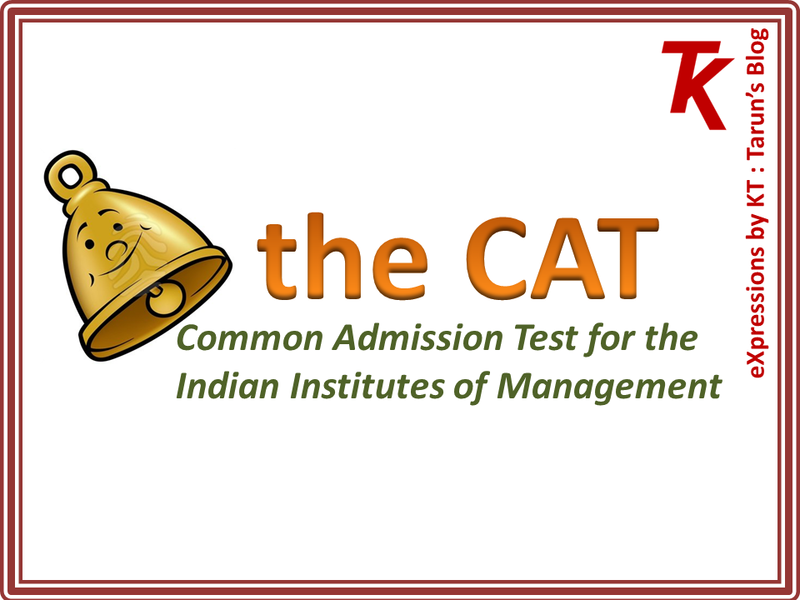 Friends, CAT notification is out as a last alarm for all those intending to appear for the examination this year. There are approximately 3 months from now to the examination and I am sure everyone is wondering where to go from the place them at present are. Now you could find yourself in multitude of situations – you may be preparing in full swing for some time now, you may be preparing but you know seriousness is yet to sink in or you may be thinking of starting now wondering if there is any time left!! Now, let me at start put on table a bias – I am an engineer by background and non-engineers may find it difficult to relate to some things that I may say here. However most of it should help out everyone in general, irrespective of their bachelor’s degree in hand. Having said that let me try to put up a few pointers that may help you out in your endeavor of overcoming the coveted exam. Those who have been preparing for some time would have already revised their theory and those starting now should realize that time for theory is limited now. Anyway the theoretical background required for CAT exam is limited. I believe if you give enough time to a 10th or 12th standard student, he may be able to solve most of the questions. The theory is never the test in the exam but logic and speed are and these can’t be found in those chapters in books or taught in those classrooms. So get ready to put in most of your time to practice. Of-course during practice if you figure out a weak area, come back to theory of that particular topic. And the practice needs to be timed as time is the bottleneck for sailing through this exam. When I say practice, I am not talking about picking a chapter in the book and solving the questions at the end of it. Solving similar kind of questions one after another is very different from the exam where each question throws a different concept at you which inherently take more time. So my suggestion is to dig up as many question papers and mock tests and attempt them in actual exam situation. Well try the best you can to get to that environment – students in their engineering colleges are advised to use library to avoid all the distractions of your hostel room (shared networks of movies or challenges on online games or friends knocking for chitchat). Others can simply lock themselves in their rooms with “Do not Disturb” on their doors. Try your best to attempt at least one mock/sample test every alternate day or at least as many as you can get your hands on. Spend double the time you spent on the test to analyze your performance. Understand which area you lagged on, which topics need revision on theory and how are you doing on time. And the days you are not onto mocks, use them to work on the identified weak areas. Come what may, do not let a day pass by when you have not given at least 3 hours to your preparations. CAT is not an exam where you need to be an idealist – all you need is to score. When that is the requirement use any legally allowed method to do that. Now when we know that all that matters for this exam is time, all efforts should be there to make you as efficient as possible. When you are onto post-test analysis, assess each of DI and LR section questions in detail even if you had a right answer. Try and develop a small theory like concept for each question. When you would have covered a huge number of tests, there is good likelihood that a few questions in the exams may have a pattern similar to what you already saw in mocks. In that case you would have ready analysis in your mind and all you need is to put in numbers. The theory / analysis you developed help because the question would have same pattern but may ask something else and so you need to have an entire assessment in your mind. Similarly for QA, develop as many small formulas as you can for each type of question you encounter. Gradually you will have an idea of which of these are more frequented and develop a cheat sheet for these to mug-up right before the exam. When it saves time, why not? The paper does not ask you on how you solved the question; so why try to prove that you do know the method. Now once you have read the question, first attempt is to read the options. You should try eliminating as many of them as possible by logic before getting to the solution. Aim should be to reduce half of them without effort and now you just have half of the problem left in your hand. Use approximation techniques to get to a nearby answer but these need to be developed during the practice sessions as both under and over approximation would hurt you. Also try developing an understanding of estimated time a question could take. You may be confident that you can solve a question but if it takes out time which could be used to solve two other questions, then better skip this one. One other mistake that we do is over-commitment. Once we start a question, we tend to take it to conclusion just because we have given it some time. The time given is a sunk cost and if that question still may take some time to get solved, leave it mid-way. The D day is still 3 months away and you can't exert yourself every moment to that day. Any attempt to do so will only wear you out and is not recommended at all. I know I said do not let a day pass without preps, but still take time to unwind. Keep up with social interactions, meet friends, go for movies on weekends and catch up on life – sincerely in preps is not aimed at making you a zombie. But do remember, the breaks are just to ease life up and nothing more. Go back to the rigor as soon as you feel you've had enough break. I guess these are more than enough for now!! I would be back with more pointers if I can think of any or at least around the exam time to give some gyan on how I tackled the last day gitters. Also do subscribe to the mail feed available on the right edge so that you do not miss on the awesome stuff about to come soon. There would be a special post on how to deal with the interview and GD process when the time comes. I have put up additional material to supplement this article. All related articles to help for CAT preparations are available at the below address. In the meantime, if you have any questions, queries, and doubts use the comments section below and I promise to respond within a day. Or if you prefer, drop in a mail at kt@expressions-kt.in to reach out to me privately.